Welcome to one more crucial pawn structure article. Now that you are aware of the importance of learning pawn structures, it’s time for you to learn the basics in pawn formations and types. 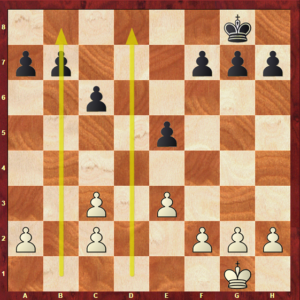 In this article you will get to know more about the fundamental concepts of every chess structure, that will be very useful in your journey through pawn structures. These are common basic concepts, yet their importance is enormous. They will allow you to evaluate any structure you come across in your chess games, and know which structural transpositions will work in your favour. Hopefully, by the end of this article, you will have improved your decision making and are ready to study all the specific pawn structures in the world, by reading our articles. Pawn chains consist in a group of pawns occupying a diagonal, therefore, in a pawn chain, every pawn is defended by the pawn in the line below. Chains always have a base: the first pawn, and the only one not defended by others; and a head, the most advanced pawn of all. The g2, f3, and d4 pawns form a pawn chain: g2, in green, is the base of the chain, and d4, in yellow, is the head. Chains are usually pretty secure, and it is a good idea to defend your central pawns using them. However, the strength of the pawn chain depends on the security of the base, therefore, if you want to undermine this pawn formation of your opponent, attacking this weakest point would be a great idea: but note that this is not always easy, and is more likely to result in an endgame, as there will be fewer pieces to defend it. Besides that, don’t forget that you have your own base to defend! 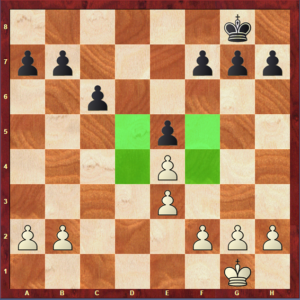 The d5 and e5 chains are examples of the complex and dynamic attacking play that these pawn formations can bring to your games. If you want to know more about these structures, read our articles about the d5 chain and the e5 chain! 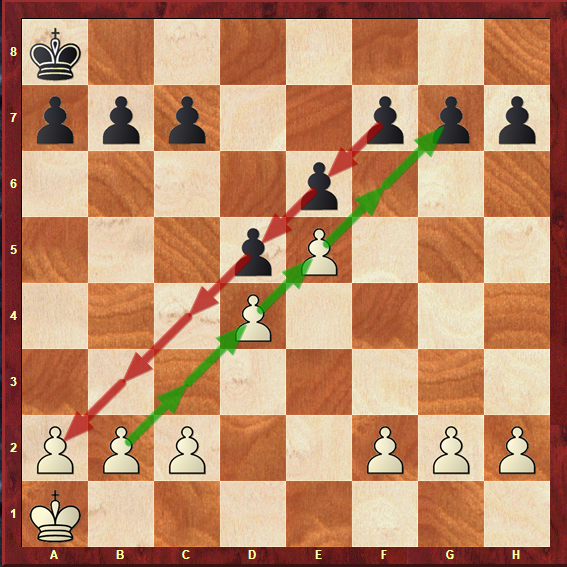 Pawn chains often lead to opposite side attacks, as you can see in the following example from the e5 chain formation. The pawns are pointing in different directions, and this leads to strong attacks for both sides. This often happens when chains are blocking each other, which is the most common situation. These structures are full of potential and will bring you a dynamic attacking game. Please note that in closed positions like the one in diagram 1b (when the central pawns are blocked) it is essential to try to stop your opponent’s counterattack, instead of just trying to succeed in the side of the board that you are playing in. Pawn islands are nothing more than a group of pawns separated from the other for at least one file. The fewer islands you have, the better – and after you have learnt a little more about pawn chains this shouldn’t be hard to understand: less islands means less chains, less bases, and therefore less weak pawns. In the following example, from the Queen’s Gambit – Hanging Pawns structure, white has 3 pawn islands, leaving him with an isolated pawn and two hanging pawns, which black can try to take advantage of. Keep reading to understand what these are, and how to play with and against them. 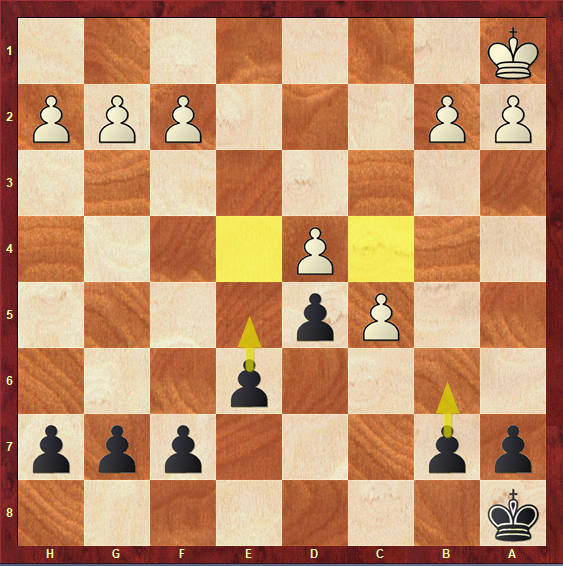 This, of course, doesn’t mean that black’s position is better: it’s just an imbalance that you should take into account. Isolated pawns are alone in the chess board, with no pawns in adjacent files to defend them. Because of this, they can become weak, especially in the endgame. Maybe you recognized this structure as the Queen’s Gambit Isolani Pawn (and if you want to know more about it, feel free to check our article on that matter). 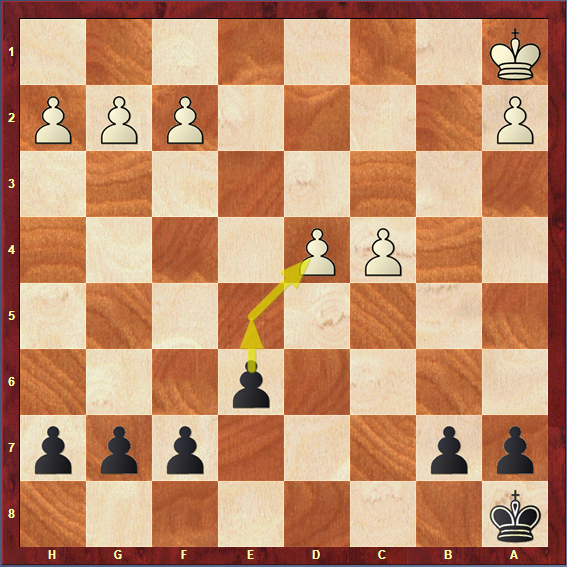 In this position, the isolated pawn on d4 can be a strength in the middlegame, as it can support a kingside attack, but if black can get through it and reach an endgame, it is likely that it will become a weakness in white’s position. 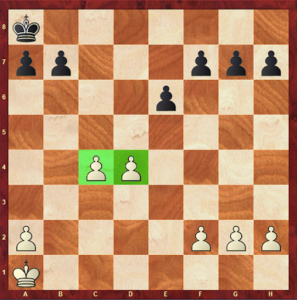 What can you do when playing with an isolated pawn? Isolated pawns become especially important when they support an outpost that can be used to activate your pieces. In this case, since the isolated pawn occupies the central square d4, the position would benefit from having a knight on e5 or c5: as you know, knights in the centre are powerful and can give a huge contribution to the attack. Besides that, when you are playing with an isolated pawn, you should avoid trading pieces at all costs, since going to an endgame is definitely something you don’t want to do in the majority of the cases. 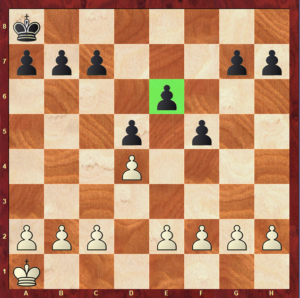 Isolated pawns will eventually become weak if you remain passive, so in this position dynamic play is key: waste no time and make sure you develop all your pieces so you can start attacking! 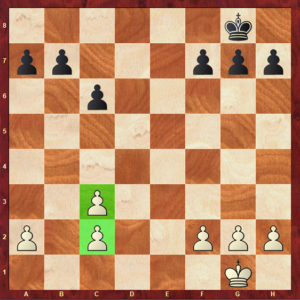 If you think your isolated pawn is not bringing any advantage to your position at all, you should always have in mind that advancing it and trying to break apart your opponent’s pawn structure could be an option! Although it might seem tempting to get rid of this potential weakness, make sure you prepare this advance very well, since doing it in the wrong timing could lead to your position being too exposed and make things a lot easier for your opponent. What should you do when playing against an isolated pawn? When you are playing against the isolated pawn, you will want to reach an endgame as soon as possible and leave your opponent without many pieces to defend it: so always remember to exchange pieces whenever possible. Another way to try to control an isolated pawn from causing too much trouble is by blocking it. This could be done with any piece, but knights are especially good blockaders because of their ability to jump over pieces. This will avoid your opponent’s potential plan of advancing his pawn, and now you can attack your target without fearing its movement. 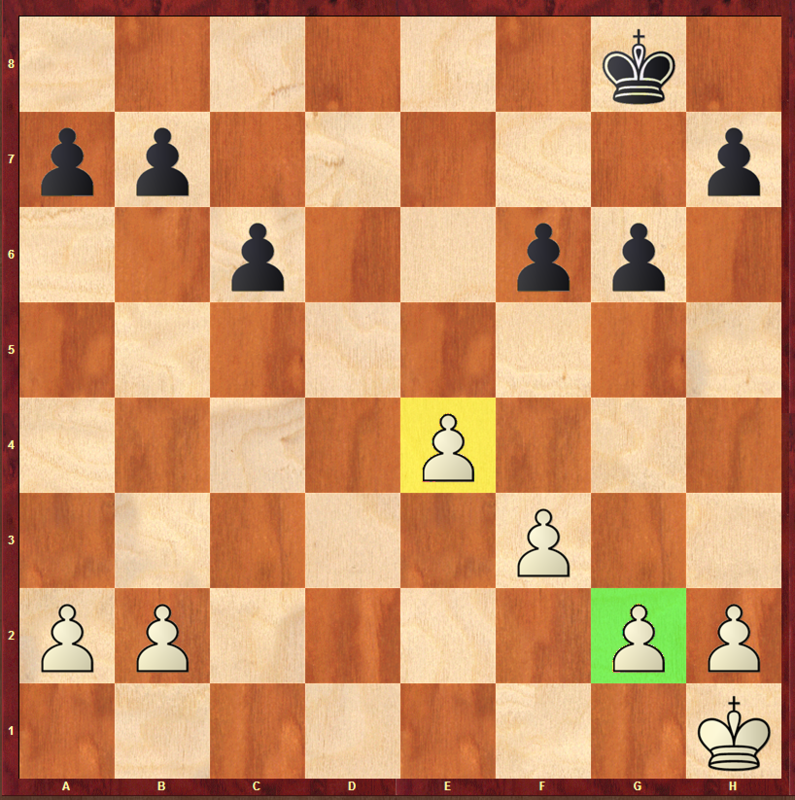 Hanging pawns are two pawns separated from the rest of the structure for at least one file. The typical example of this formation is the Queen’s Gambit – Hanging Pawns structure, though this duo can appear in a lot of different positions. In this position, the number of islands and placement of white’s pawns can make you think that they must not be good. However, when combined with active play, hanging pawns can be a powerful formation. Since hanging pawns are a structural weakness, just like when it comes to isolated pawns, dynamic play and active pieces are crucial. However, if you are ahead in development, it can be great to have hanging pawns in your structure. 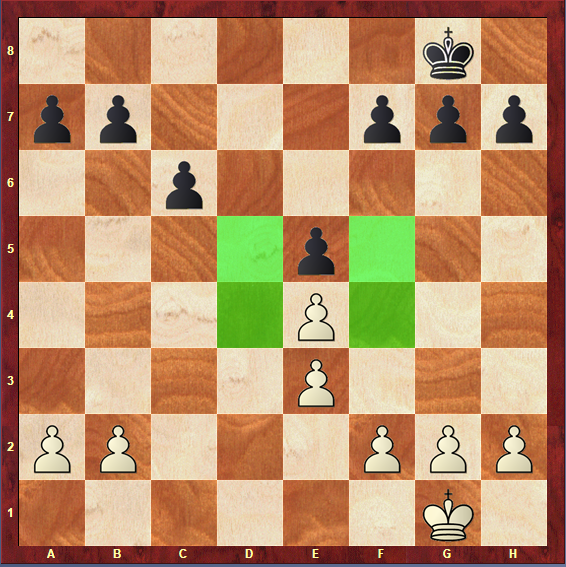 A typical plan when playing with this pawn formation is to advance the d4 pawn, trying to create a passed pawn. 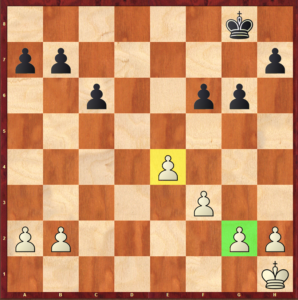 This can happen in a lot of different positions with hanging pawns. 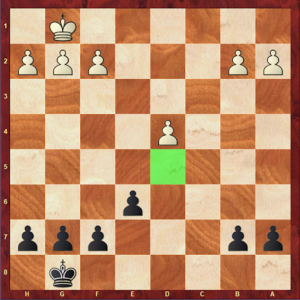 Besides that, trying to compensate your weak pawn structure with active play in the open/semi-open files is usually a good idea. Another important thing to keep in mind when playing with this formation is that hanging pawns are usually way stronger when they stand side by side, controlling a lot of important central squares. This can be a decisive advantage, as center control is very important. Because of this, you have to be cautious when it comes to advancing one of this pawns, and make sure you only do this with a great justification. Otherwise, you might just be creating holes in your structure for your opponent to explore. 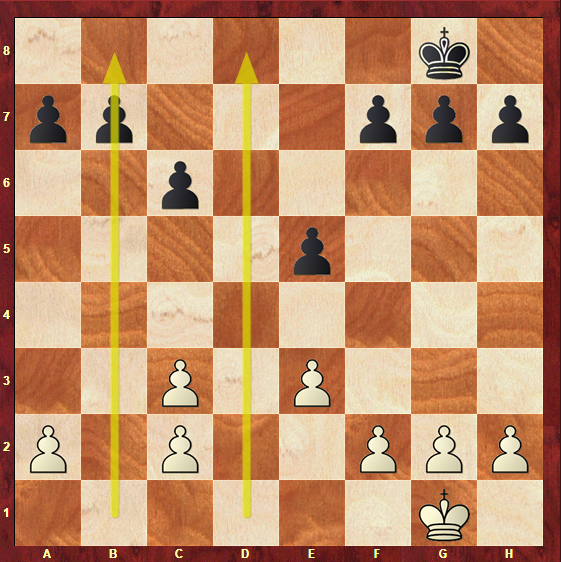 Finally, is is important to note that, as we referred in the isolated pawns section, you don’t want to bring a weak pawn formation to an endgame, as it will be harder to support. 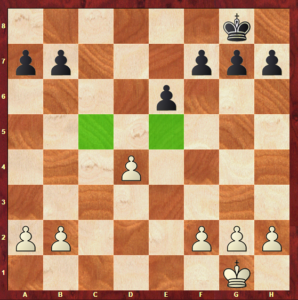 Instead, you should try to prolong the middlegame, and cause as many trouble as you can, using this pawns for your own advantage. An efficient way to fight hanging pawns is trying to turn them into an isolated pawn. How? You would have to be able to exchange a piece and force your opponent to take it back with his pawn, separating the duo; or advance a pawn of your own, in order to exchange it for one of the hanging pawns, leaving the other one alone. Besides all of this, keep in mind that dynamic middlegame play is exactly what your opponent wishes for in this position, and you should try to keep things rather calm and exchange pieces until an endgame is reached, and you will have an advantage. Note that the two pawn formations that we just discussed have a lot of aspects in common and transformations from one to another are very common. Hopefully, now you will know how to evaluate this positions and understand which structural transpositions will work in your favour. Backward Pawns were left behind by the pawns next to them, therefore they don’t have any defending them. Because of this reason, backwards pawns are usually weak. 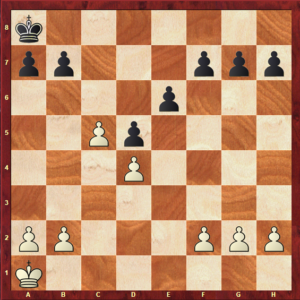 An example of backwards pawns is the Stonewall Formation, covered in an article which you can check here. In the diagram above, the e6 pawn is backwards because both d5 and f5 pawns are more advanced than it. How can you play against backward pawns? As you may have noticed, not only the e6 pawn was left weak, but also the e5 square. This is something white can try to take advantage of, since your opponent’s pawn formation is quite solid, with no major weaknesses. This happens in the majority of backward pawns positions: sometimes it is better to explore the weaknesses around the pawns than the weak pawn itself, cause it is normal that, with many pieces on the board, your opponent will be able to defend it. So, instead of trying to simply gain material, you can try to reach a strategic advantage here. In the above position, from the Panov’s formation structure (whose article you can check here), Black’s plan can go from trying to undermine white’s pawn structure, with the advance of the b or the e pawn, to trying to take advantage of the weakened squares e4 and c4. 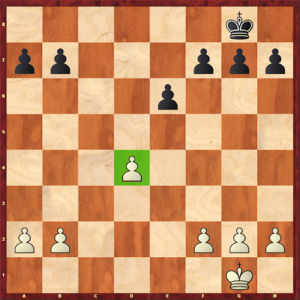 What are the plans for the player with the backward pawn? 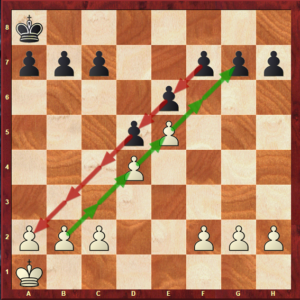 Since backward pawns are a weak formation, in order to get in this pawn structure, your opponent must have a good justification. 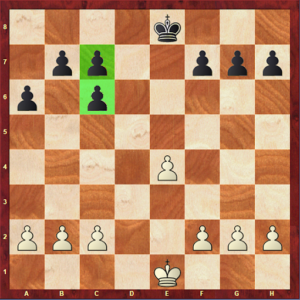 In most cases, like in the Stonewall structure, quick attacks are supported easily because of the advanced pawns, bringing interesting middlegame battles with lots of counterplay. As you can see in the diagram above, the solid and stable centre gives black the necessary conditions to launch an aggressive kingside attack, that shouldn’t be discredited. 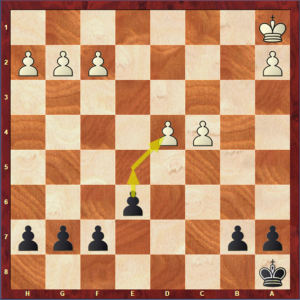 Pawn storms and rook lifts often happen in these dynamic games, resulting in sharp interesting positions. White’s plan in this position could be creating a passed pawn with the advance b2-b4-b5. Doubled pawns occupy the same file, which makes them unable to defend each other. 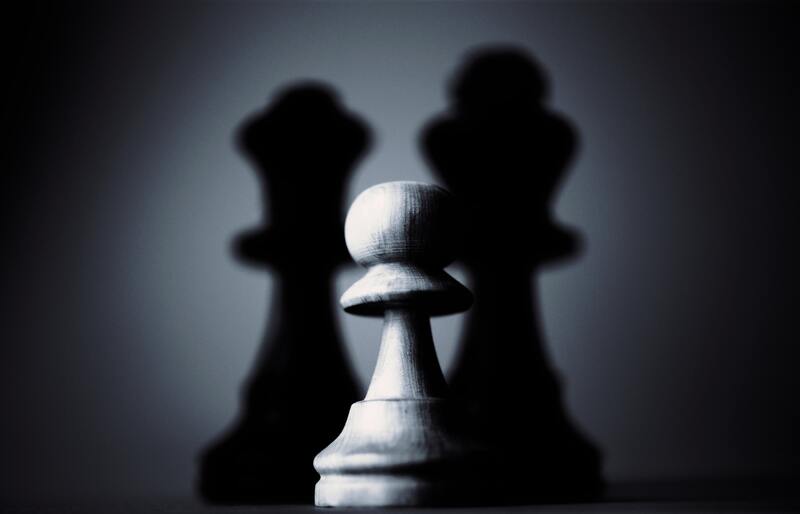 The pawn that is more advanced restricts the other one. Doubled pawns are weak, especially in endgames, as they are easily attacked. However, in order to create doubled pawns, exchanges must be made. You have to think carefully if the exchange you are making in order to create doubled pawns is worthy, or if it will in some way benefit your opponent. 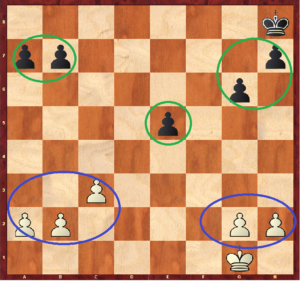 When playing against doubled pawns, trying to rush into an endgame could be a good idea. Of course, it always depends on the position, though doubled pawns tend to be weaker without lots of pieces in play. Another thing that you can try to take advantage of is the fact that you have more possibilities when it comes to mobility, as your pawns are not interrupting each others ways. In this way, it will be easier for you to create passed pawns. This position can emerge from the Ruy Lopez opening – exchange variation. It is known for good endgames for white, sometimes even winning positions; but also for an excellent middlegame play for Black. 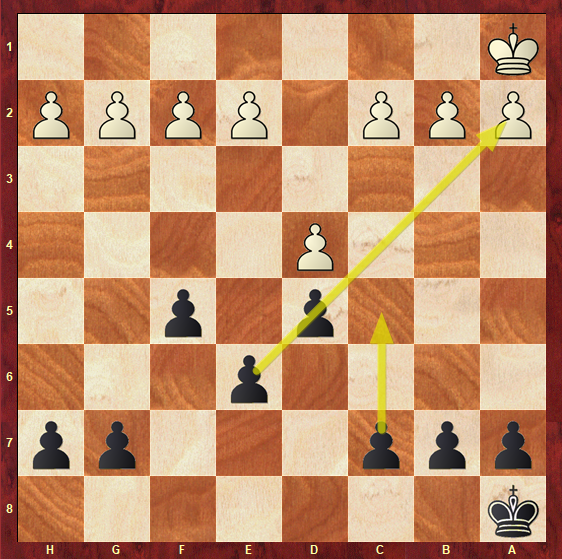 When playing in a position like the one in diagram 1u, make sure you try to control your opponent’s initiative and counterplay, since those could turn his weak pawns into an advantage. Last but not least, remember that, before exchanging the pieces that will lead to the creation of doubled pawns for your opponent, you should take in mind several factors, as such the activity and evaluation of the game, your ability to attack those pawns, and the number of pieces in the board. If you want to exchange a superior piece just to create doubled pawns, you must think twice if it is worth it: doubled pawns are not the end of the world, and it is possible to get great positions with them! 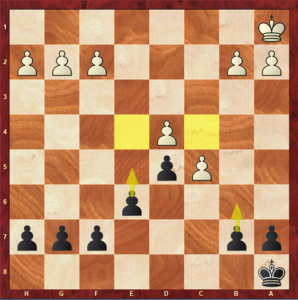 If you want to undermine your opponent’s pawn structure, your target should be the weakest pawn of all. Active play and correct piece placement can make up for the weaknesses in your structure: remember this and waste no time. 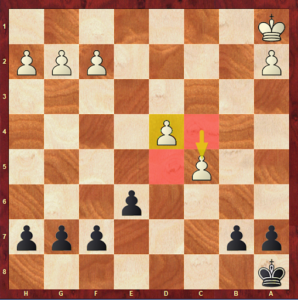 A structural weakness is only a real disadvantage if it can be attacked: if you can enjoy the advantages that your pawn formation brings (for example the open files, the space advantage and the outposts) and your opponent can not attack your pawns, there is no reason why you would be in a worst position. Congratulations on reaching the end of this article! By now, you are ready to take a dive into deeper waters in which concerns pawn structures, and start reading our articles which cover them in detail. The concepts that you have just learned will enable you to deeply understand them.